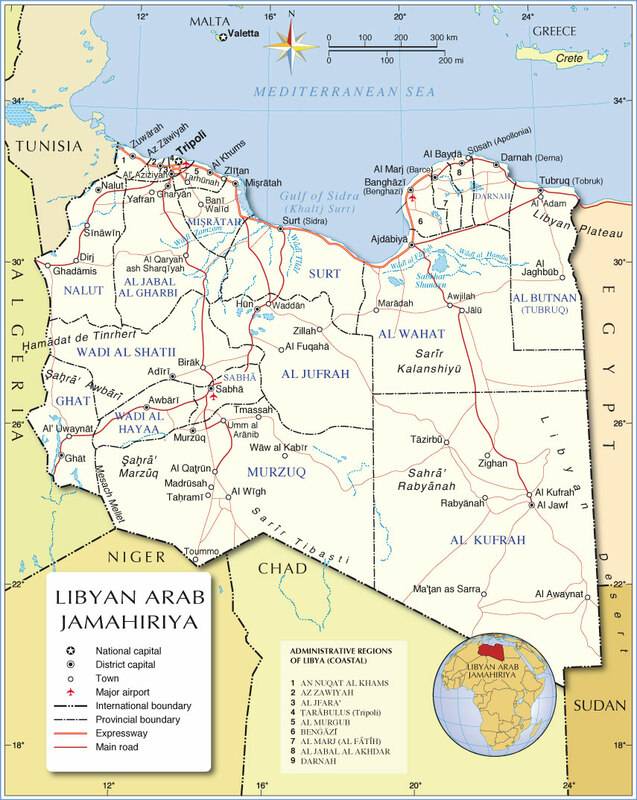 Libya is a country in North Africa bordered by the Mediterranean Sea to the north, Egypt to the east, Sudan to the southeast, Chad and Niger to the south, and Algeria and Tunisia to the west. With an area of almost 1.8 million square kilometres (700,000 sq mi), Libya is the third largest country in Africa by area, and the 17th largest in the world. The largest city and capital is Tripoli. The three traditional parts of the country are Cyrenaica, Fezzan and Tripolitania. 1521 Cyrenaica part of the Ottoman Empire. 14 Aug 1551 Tripolitania part of the Ottoman Empire. 29 Jul 1711 Tripoli Regency under de facto hereditary Qaramanli dynasty. 26 May 1835 Direct Ottoman rule restored. (in rebellion against Ottoman sovereignty). 03 Oct 1911 Italian occupation. 18 Oct 1912 Ceded to Italy by the Ottoman Empire. 16 Nov 1918 - 1923 Tripolitanian Republic (in revolt against Italy). 12 Nov 1922 Annexed to Italy (nominally 18 May 1919). 01 Jan 1934 Tripolitania, Cyrenaica, Fezzan united as Colony of Libya. 13 May 1943 End of Italian rule. 15 Feb 1947 Italy formally cedes Libya to the Allies. 21 Nov 1949 United Nations supervision, under British and French. 24 Dec 1951 Independence as United Libyan Kingdom. 25 Apr 1963 Libyan Kingdom (federal arrangement abolished). 01 Jan 1972 - 19 Nov 1977 Part of Federation of Arab Republics (Egypt, Libya and Syria). 02 Mar 1977 Socialist People's Libyan Arab Jamahiriya. Apr 1986 Great Socialist People's Libyan Arab Jamahiriya. 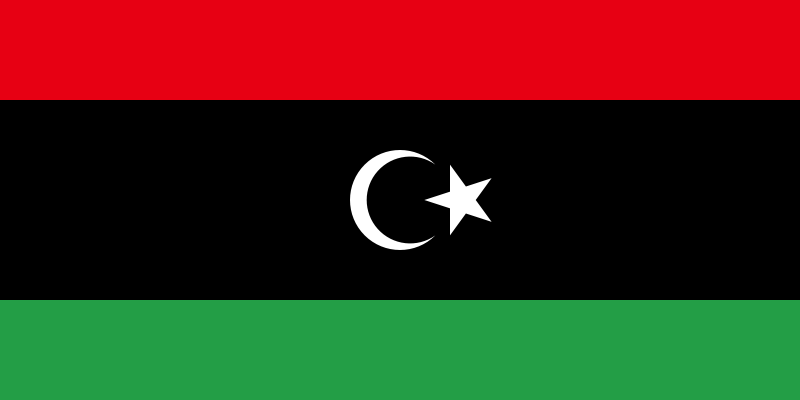 23 Aug 2011 Libya (proclaimed on 10 Aug 2011). 1521 Cyrenaica part of the Ottoman Empire (under Tripolitania). 15 Oct 1912 Italian protectorate declared Cirenaica (Cyrenaica). 17 May 1919 Italian Cirenaica colony. 1929 Italy derecognizes the Order. 01 Jan 1934 Tripolitania, Cirenaica, and Fezzan united as Libya. 1941), Derna (Feb 1941), El Agheila and Benghazi (Feb 1941). Feb 1941 British administration (Cyrenaica district). Derna (Apr 1941), and Tobruk 30 (Apr 1941). (Dec 1941), Tobruk (4 Dec 1941) and Gazala (15 Dec 1941). Tobruk (21 Jun 1942), and Bardia (June 1942). Derna (15 Nov 1942) and Benghazi (20 Nov 1942). Oct 1946 Sanusi emir recognized by Britain. 01 Mar 1949 Independence proclaimed (Emirate of Cyrenaica). 01 Jun 1949 Independence (Emirate of Cyrenaica) recognized by Britain. 21 Nov 1949 Cyrenaica autonomous. 24 Dec 1951 Incorporated into Libya. 25 Apr 1963 Autonomy abolished. On the coast of eastern Libya, a Greek Colony-Kingdom founded from Thera in the 7th century BCE. The interior just behind the coastal settlements was the scene of intense fighting during WWII between FM. Montgomery and FM Rommel. Capital: Benghazi (Barce 1942-1943). Zoheïr ibn Kaïs al-Balawi...........................667 - ? 'Abd as-Salem as-Sabaï..............................765 - ? Tulunid (Egypt) gov. appointed by Capt. Tabargi.....881 - ? Aflah an-Nashib al-Kutami...........................918 - ? Sayf ad-Din Ata Allah ibn Azzaz....................1264 - ? Arif ibn Amru......................................2nd half of 14th cent. Amru ibn Arif......................................2nd half of 14th cent. exile in Egypt from 1923. He was military administrator to 10 Mar 1943. He was resident from 17 Sep 1949. 918 Sultanate of Fezzan founded. 1190 - 12.. Annexed by Egypt. 1212 Annexed by Borno (Kanem). 1580 - 1582 Incorporated into Ottoman Empire. 1612 - 1614 Incorporated into Ottoman Empire. 1623 - 1626 Incorporated into Ottoman Empire. 1689 - 1690 Incorporated into Ottoman Empire. 1843 Incorporated into Ottoman Empire (Fezzan Paskalik). 1909 - 1914 Sanusi rule. 15 Oct 1912 - 11 Jan 1943 Annexed by Italy. Aug 1914 - Jan 1915 Italian occupation. 1915 - 1923 Sanusi rule (restored). 1923 - 1930 Anarchy, ruled by Arab nomads. 01 Jan 1934 Fezzan, Tripolitania, and Cyrencia united as Libya. 08 Jan 1943 Fezzan occupied by Free French, forces enter Sebha. 10 Jan 1947 Fezzan Territory, under French administration. 01 Jan 1948 Fezzan-Ghadamès Territory, under French administration. 24 Dec 1951 Incorporated into Libya, with autonomy. Fezzan is the arid interior of western Libya. Capital: Sebha 1943-1951 (Murzuq c.1566-1912). Kingdom of Phazana - dynasty current in the 6th and 7th centuries, the Berauna. The Nesur were a local clan who claimed a connection to the old Berauna dynasts. They governed Fezzan on behalf of the Kanem-Bornu (Chad) Empire. The Khorman were an Arab tribe who overthrew the Nesur and reduced the local population to that chattal slaves. The Beni Muhammad were derived from a Moroccan Sharif who broke the power of the Khorman in the mid-16th century and established a Sultanate in Fezzan. His descendants were at times tributary to the Pasha of Tripoli, (the Ottoman Governor of Libya), but just as often at war with the Ottomans. Even in times of obedience, their power within their own borders was effectively absolute. Later he became Governor of Fezzan: 24 Dec 1951 - 12 Jun 1954. 26 Mar 909 - 977 Incorporated into Egypt. 977 Part of Zirid Kingdom. 1146 - 22 Jan 1160 Tripoli under Norman rule (subordinated to Kingdom of Sicily). 1160 - 1248 Incorporated into Morocco (Almohad Empire). 1172 - 1190 Egyptian rule. .... - 1202 Egyptian rule. 1248 - 1327 Incorporated into Tunis. 1401 - 1482 Incorporated into Tunis. 1412 - 1421 Egyptian rule. 24 Jul 1510 Spanish rule in Tripoli (subordinated to Sicily). Hospitaller (Knights take possession 25 Jul 1530). 14 Aug 1551 Province of the Ottoman Empire. 26 May 1835 Tripoli Ottoman province (direct Ottoman rule). 05 Nov 1911 Italian Tripolitania protectorate. (nominally from 18 May 1919). 01 Jan 1934 Cyrenaica, Tripolitania, Fezzan united as Libya. 23 Oct 1942 British administration (Tripolitania district). A port in western Libya, it is the country's largest city. Capital: Tripoli (Republic: Aziziyah 1918-1923). Phoenician colony of Oea - It was founded as a Carthaginian trading post. "Tripoli" is named as such because Oea formed one settlement within an extended tri-cities district. The other settlements were Sabratha (now al-Khums) and Leptis Magna (sometimes transcribed as Lepcis; the nearest modern town of any size is Misratah). Leptis Magna city had been in a downward spiral since the 360's, suffering much from Barbarian attacks, disastrous Winter flooding, and encroaching sand dunes; by the time of the Arab conquest in 642, there was essentially nothing left of the community. By the end of the 7th century, references to Misratah, a caravanserai way-station, begin to occur. Leptis Magna remains one of the best-preserved Roman cities, owing to it being more-or-less buried under the shifting sands until quite recently. Leptis Magna under Vandals in c. 455 and Sabratha c. 450. In this era, the governors of Tripoli were appointed by those of Ifriqiyya and not by the Caliphs directly. Bakr ibn Issa al-Kaïsi............................713/4 - ? Hamid ibn Abdallah al-'Aqqi.........................755 - ? al-Junayd ibn Bashar al-Assedi......................768 - ? Djebel Nefusah is a hill country in the interior of western Libya, south of Tripoli. The district was in the hands of a group of Kharijite Imams of the Ibadhiyah sect during the 8th through 10th centuries CE. The Kharijites ("Withdrawers", "Seceders") are Muslims who rejected both Sunni and Shi'ite interpretations of Caliphate succession and developed an idealist and deed-oriented version of Islam. The Ibadhiyah are the moderate wing of the Kharijtes, as opposed to the radical Azariqah movement of Basra, in Iraq. Khlaf ibn as-Samh al-Ma'afiri.......................812 - ? al-Abbas ibn Ahmed Tulun............................880 - ? al-Aflah ibn al-Abbas (2nd time)....................896 - ? Abdallah ibn Muhammed at-Tamimi (E. Ifriqiyya)......859 - ? Khazrun ibn Khalifa.....................................1038 - ? He continued to rule under Morocco (Almohad) till 1172. Nominally Ottoman governors (Beys), the Karamanli in fact ruled as de facto independents. In 1801, Yusuf demanded a tribute of $225,000 from United States President Thomas Jefferson. Jefferson, confident in the ability of the new United States Navy to protect American shipping, refused the Yusuf Pasha's demands. Yusuf Pasha unofficially declare war in May 1801 by chopping down the flagpole before the American consulate. The US Navy successfully blockaded Tripoli's harbors in 1803. After some initial military successes, most notably the capture of the USS Philadelphia, the pasha soon found himself threatened with invasion by American ground forces following the Battle of Derna (April 27 - May 13, 1805) and the reinstatement of his deposed brother, Hamet Karamanli, recruited by the American army officer William Eaton. Yusuf Pasha signed a treaty ending the war on June 10, 1805. The Battle of Derne was the first recorded land battle of the United States on foreign soil after the American Revolutionary War. By 1819, the various treaties of the Napoleonic Wars had forced the Barbary states to give up corsair activity almost entirely, and Tripoli's economy began to crumble. As Yusuf Pasha weakened, factions sprung up around his three sons; though Yusuf abdicated in 1832 in favor of his son Ali III, civil war soon resulted. Ottoman Sultan Mahmud II sent in troops ostensibly to restore order, but instead deposed and exiled Ali III, marking the end of both the Karamanli dynasty and an independent Tripoli. Merirey is spoken of as being the leader of the Labu, a coalition of folk associated with the Sea-Peoples. Buyuwawa is spoken of as being the leader of a Sea-People called the Meshwesh. See the Sea Peoples for additional info on that tribe. See Fezzan and Tripoli for local conditions indicated above. He arrived in Tripoli on 18 Jan 1950. The discovery of significant oil reserves in 1959 and the subsequent income from petroleum sales enabled the Kingdom of Libya to transition from one of the world's poorest nations to a wealthy state. It also discontent mounted with the rise of Nasserism and Arab nationalism/socialism throughout North Africa and the Middle East. Coup d'état on 01 sep 1969 by a group of about 70 young army officers lead by Muammar Gaddafi, known as the Free Officers Movement and enlisted men mostly assigned to the Signal Corps, seized control of the government and in a stroke abolished the Libyan monarchy. The coup was launched at Benghazi, and within two hours the takeover was completed. Army units quickly rallied in support of the coup, and within a few days firmly established military control in Tripoli and elsewhere throughout the country. Popular reception of the coup, especially by younger people in the urban areas, was enthusiastic. Fears of resistance in Cyrenaica and Fezzan proved unfounded. No deaths or violent incidents related to the coup were reported. Currency: Pound = 100 piastres (قرش, qirsh) = 1000 milliemes (مليم). When Libya was a part of the Ottoman Empire, the country used the Ottoman qirsh (XOTP), issuing some coins locally until 1844. When Italy took over the country in 1911, the Italian lira was introduced. In 1943, Libya was split into French and British mandate territories. Algerian francs were used in the French mandate, whilst Tripolitanian lira issued by the British Military Authorities were used in the British mandate. In 1951, the pound was introduced, replacing the franc and lira at rates of 1 Pound = 480 Lire = 980 Francs. Coins were issued in 1952 in denominations of 1, 2 and 5 milliemes, 1 and 2 piastres. "P.V." designer initials below the bust of King Idris I on all 1952 issues. KM#1 1 millieme. Year: 1952. Weight: 2.99g [3.00g]. Metal: Bronze. Diameter: 18.00 mm. Edge: Plain. Alignment: Medal. Mint: British Royal mint. Obverse: Crown on the top. Numeral "١" (1) written in the center with "مليم" (Millieme) below it and followed by Date "١٩٥٢" (1952). Wreath surrounds the Value. "مليم" (Millieme) written in Arabic on both sides anti-clockwise. "ONE MILLIÈME" written at the bottom. Reverse: King Idris I's portrait wearing traditional cap, facing right in the center. (ملك ليبيا) "King of Libya" written at right side in Arabic anti-clockwise. "إدريس الأول" (Al-Idris, the First) written at left side in Arabic anti-clockwise. "PV" engraver initials at the bottom left side. Mintage: 7,750,000 + 32 Proof. Minted Years: One year type. Engraver: Paul Vincze. Note: Paul Vincze (15 August 1907 in Galgagyörk, Hungary – 05 March 1994 in Grasse, France) was a Jewish-Hungarian designer of coins and medal, and sculptor. Vincze's artistic works featured with the classical artistic style as shown on the coins he designed. KM#2 2 milliemes. Year: 1952. Weight: 5.96g [6.00g]. Metal: Bronze. Diameter: 24.00 mm. Edge: Plain. Alignment: Medal. Mint: British Royal mint. Obverse: Crown on the top. Numeral "٢" (2) written in the center with "مليمان" (Two Milliemes) below it and followed by Date "١٩٥٢" (1952). Wreath surrounds the Value. "مليمان" (Two Milliemes) in Arabic on both sides anti-clockwise. "TWO MILLIÈMES" written at the bottom. Reverse: King Idris I's portrait wearing traditional cap, facing right in the center. (ملك ليبيا) "King of Libya" written at right side in Arabic anti-clockwise. "إدريس الأول" (Al-Idris, the First) written at left side in Arabic anti-clockwise. "PV" engraver initials at the bottom left side. Mintage: 6,650,000 + 32 Proof. Minted Years: One year type. Engraver: Paul Vincze. KM#3 5 milliemes. Year: 1952. Weight: 9.72g [10.00g]. Metal: Bronze. Diameter: 28.00 mm. Edge: Plain. Alignment: Medal. Mint: British Royal mint. Obverse: Crown on the top. Numeral "٥" (5) written in the center with "مليمات" (Milliemes) below it and followed by Date "١٩٥٢" (1952). Wreath surrounds the Value. "خمسة" (Five) written in Arabic on the left side anti-clockwise and "مليمات" (Milliemes) in Arabic on right side anti-clockwise. "TWO MILLIÈMES" written at the bottom. Reverse: King Idris I's portrait wearing traditional cap, facing right in the center. (ملك ليبيا) "King of Libya" written at right side in Arabic anti-clockwise. "إدريس الأول" (Al-Idris, the First) written at left side in Arabic anti-clockwise. "PV" engraver initials at the bottom left side. Mintage: 7,680,000 + 32 Proof. Minted Years: One year type. Engraver: Paul Vincze. KM#4 1 piastre. Year: 1952. Weight: 3.77g [3.75g]. Metal: Copper-Nickel. Diameter: 19.50 mm. Edge: Reeded. Alignment: Medal. Mint: British Royal mint. Obverse: Crown on the top. Numeral "١" (1) written in the center with "قرش ليبي" (Libyan Piastre) below it and followed by Date "١٩٥٢" (1952). Wreath surrounds the Value. "قرش" (Piastre) written in Arabic on the left side anti-clockwise and "ليبي" (Libyan) in Arabic on right side anti-clockwise. "ONE PIASTRE" written at the bottom. Reverse: King Idris I's portrait wearing traditional cap, facing right in the center. (ملك ليبيا) "King of Libya" written at right side in Arabic anti-clockwise. "إدريس الأول" (Al-Idris, the First) written at left side in Arabic anti-clockwise. "PV" engraver initials at the bottom left side. Mintage: 10,200,000 + 32 Proof. Minted Years: One year type. Engraver: Paul Vincze. KM#5 2 piastres. Year: 1952. Weight: 7.46g [7.50g]. Metal: Copper-Nickel. Diameter: 26.00 mm. Edge: Reeded. Alignment: Medal. Mint: British Royal mint. Obverse: Crown on the top. Numeral "٢" (2) written in the center with "قرشان ليبيان" (Libyan Two Piastres) below it and followed by Date "١٩٥٢" (1952). Wreath surrounds the Value. "قرشان" (Two Piastres) written in Arabic on the left side anti-clockwise and "ليبيان" (Libyan) in Arabic on right side anti-clockwise. "TWO PIASTRES" written at the bottom. Reverse: King Idris I's portrait wearing traditional cap, facing right in the center. (ملك ليبيا) "King of Libya" written at right side in Arabic anti-clockwise. "إدريس الأول" (Al-Idris, the First) written at left side in Arabic anti-clockwise. "PV" engraver initials at the bottom left side. Mintage: 6,075,000 + 32 Proof. Minted Years: One year type. Engraver: Paul Vincze. The original plan of restriking the 1952 coin series was overruled by King Idris. A self-effacing devout Muslim, Idris refused to allow his portrait to be featured on Libyan currency, so the Senussi crest came to replace his portrait on coins and notes. In 1965, a second series of coins was issued in denominations of 1, 5, 10, 20, 50 and 100 milliemes. The pound was replaced, at par, by the dinar in 1971 following the Libyan Revolution of 1969. These coins continued to circulate after 1971 as no new coins were issued until 1975. KM#6 1 millieme. Year: 1965-AH1385. Weight: 1.69g [1.75g]. Metal: Nickel-Brass. Diameter: 16.00 mm. Edge: Plain. Alignment: Medal. Mint: N/A. Obverse: "المملكة الليبية" (Libyan Kingdom) written at the top in Arabic. Crowned national arms in the center. Dates "١٩٦٥ - ١٣٨٥" (1965 - 1385) written at the bottom. Reverse: Numeral "١" (1) written in the center with "مليم" (Millieme) below it. Wreath surrounds the Value. "ONE MILLIEME" written at the bottom. Mintage: 11,000,000. Minted Years: One year type. KM#7 5 milliemes. Year: 1965-AH1385. Weight: 2.53g [2.50g]. Metal: Nickel-Brass. Diameter: 12 sided; 20.00 mm. Edge: Plain. Alignment: Medal. Mint: N/A. Obverse: "المملكة الليبية" (Libyan Kingdom) written at the top in Arabic. Crowned national arms in the center. Dates "١٩٦٥ - ١٣٨٥" (1965 - 1385) written at the bottom. Reverse: Numeral "٥" (5) written in the center with "مليمات" (Milliemes) below it. Wreath surrounds the Value. "FIVE MILLIEMES" written at the bottom. Mintage: 8,500,000. Minted Years: One year type. KM#8 10 milliemes. Year: 1965-AH1385. Weight: 2.99g [3.00g]. Metal: Copper-Nickel. Diameter: 19.50 mm. Edge: Reeded. Alignment: Medal. Mint: N/A. Obverse: "المملكة الليبية" (Libyan Kingdom) written at the top in Arabic. Crowned national arms in the center. Dates "١٩٦٥ - ١٣٨٥" (1965 - 1385) written at the bottom. Reverse: Numeral "١٠" (10) written in the center with "مليمات" (Milliemes) below it. Wreath surrounds the Value. "TEN MILLIEMES" written at the bottom. Mintage: 17,000,000. Minted Years: One year type. KM#9 20 milliemes. Year: 1965-AH1385. Weight: 5.84g [6.00g]. Metal: Copper-Nickel. Diameter: 24.00 mm. Edge: Plain. Alignment: Medal. Mint: N/A. Obverse: "المملكة الليبية" (Libyan Kingdom) written at the top in Arabic. Crowned national arms in the center. Dates "١٩٦٥ - ١٣٨٥" (1965 - 1385) written at the bottom. Reverse: Numeral "٢٠" (20) written in the center with "مليما" (Milliemes) below it. Wreath surrounds the Value. "TWENTY MILLIEMES" written at the bottom. Mintage: 8,750,000. Minted Years: One year type. KM#10 50 milliemes. Year: 1965-AH1385. Weight: 6.93g [7.00g]. Metal: Copper-Nickel. Diameter: 12-sided; 26.00 mm. Edge: Plain. Alignment: Medal. Mint: N/A. Obverse: "المملكة الليبية" (Libyan Kingdom) written at the top in Arabic. Crowned national arms in the center. Dates "١٩٦٥ - ١٣٨٥" (1965 - 1385) written at the bottom. Reverse: Numeral "٥٠" (50) written in the center with "مليما" (Milliemes) below it. Wreath surrounds the Value. "FIFTY MILLIEMES" written at the bottom. Mintage: 8,000,000. Minted Years: One year type. KM#11 100 milliemes. Year: 1965-AH1385. Weight: 10.74g [11.00g]. Metal: Copper-Nickel. Diameter: 29.50 mm. Edge: Reeded. Alignment: Medal. Mint: N/A. Obverse: "المملكة الليبية" (Libyan Kingdom) written at the top in Arabic. Crowned national arms in the center. Dates "١٩٦٥ - ١٣٨٥" (1965 - 1385) written at the bottom. Reverse: Numeral "١٠٠" (100) written in the center with "مليم" (Millieme) below it. Wreath surrounds the Value. "ONE HUNDRED MILLIEMES" written at the bottom. Mintage: 8,000,000. Minted Years: One year type. He contiues in rebellion at Sirte to 20 Oct 2011. He also served as Prime Minister from 16 Jan 1970 to 16 Jul 1972. 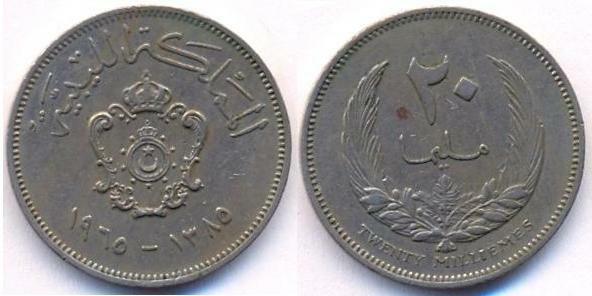 The dinar (Arabic: دينار‎) is the currency of Libya. Its ISO 4217 code is "LYD". The dinar is subdivided into 1000 dirham (درهم). It was introduced in 1971 and replaced the pound at par. It is issued by the Central Bank of Libya, which also supervises the banking system and regulates credit. In 1972, the Libyan Arab Foreign Bank was established to deal with overseas investment. 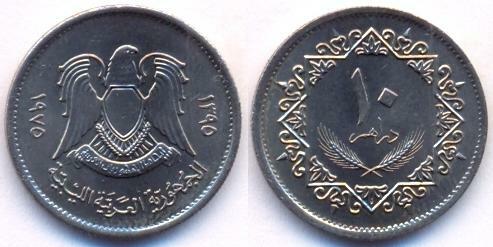 Until 1975, old coins denominated in milliemes (equal to the dirham) circulated. 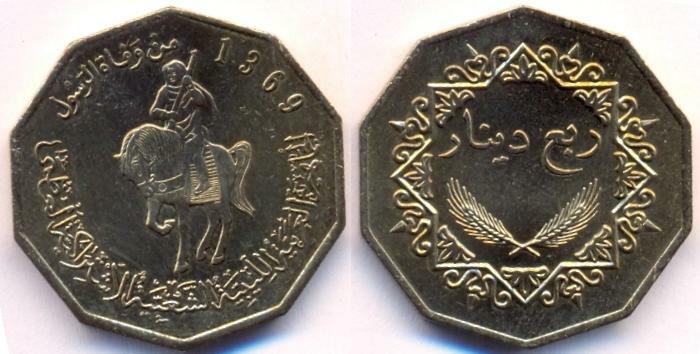 In 1975, coins were introduced in denominations of 1, 5, 10, 20, 50 and 100 dirham which bore the coat of arms of the Federation of Arab Republics. "الجماهيرية العربية الليبية" [Libyan Arab Republic] is written on all 1975 issues. KM#12 1 dirham. Year: 1975-AH1395. Weight: 1.69g [1.75g]. Metal: Brass Clad Steel. Diameter: 16.00 mm. Edge: Reeded. Alignment: Medal. Mint: N/A. Obverse: Coat and Arms in the center. Dates on both sides. "Libyan Arab Republic" in Arabic at the bottom. Reverse: "1 dirham" value in Arabic with wreath below, surrounded by design. Mintage: 20,000,000 + N/A Proof. Minted Years: One year type. KM#13 5 dirhams. Year: 1975-AH1395. Weight: 2.48g [2.50g]. Metal: Brass Clad Steel. Diameter: 18.00 mm. Edge: Plain. Alignment: Medal. Mint: N/A. Obverse: Coat and Arms in the center. Dates on both sides. "Libyan Arab Republic" in Arabic at the bottom. Reverse: "5 dirham" value in Arabic with wreath below, surrounded by design. Mintage: 23,000,000 + N/A Proof. Minted Years: One year type. KM#14 10 dirhams. Year: 1975-AH1395. Weight: 2.98g [3.00g]. Metal: Copper-Nickel Clad Steel. Diameter: 19.50 mm. Edge: Reeded. Alignment: Medal. Mint: N/A. Obverse: Coat and Arms in the center. Dates on both sides. "Libyan Arab Republic" in Arabic at the bottom. 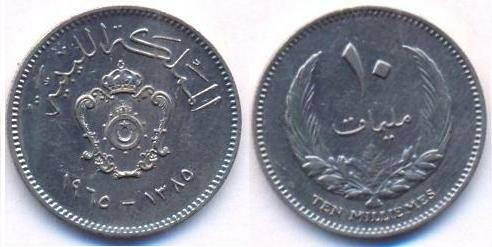 Reverse: "10 dirham" value in Arabic with wreath below, surrounded by design. Mintage: 52,750,000 + N/A Proof. Minted Years: One year type. KM#15 20 dirhams. Year: 1975-AH1395. Weight: 5.41g [5.50g]. Metal: Copper-Nickel Clad Steel. Diameter: 24.00 mm. Edge: Plain. Alignment: Medal. Mint: N/A. Obverse: Coat and Arms in the center. Dates on both sides. "Libyan Arab Republic" in Arabic at the bottom. Reverse: "20 dirhama" value in Arabic with wreath below, surrounded by design. Mintage: 25,500,000 + N/A Proof. Minted Years: One year type. KM#16 50 dirhams. Year: 1975-AH1395. Weight: 6.21g [6.25g]. Metal: Copper-Nickel. Diameter: 25.00 mm. Edge: Plain. Alignment: Medal. Mint: N/A. Obverse: Coat and Arms in the center. Dates on both sides. "Libyan Arab Republic" in Arabic at the bottom. Reverse: "50 dirhama" value in Arabic with wreath below, surrounded by design. Mintage: 25,640,000 + N/A Proof. Minted Years: One year type. KM#17 100 dirhams. Year: 1975-AH1395. Weight: 8.00g [8.00g]. Metal: Copper-Nickel. Diameter: 27.50 mm. Edge: Reeded. Alignment: Medal. Mint: N/A. Obverse: Coat and Arms in the center. Dates on both sides. "Libyan Arab Republic" in Arabic at the bottom. Reverse: "100 dirham" value in Arabic with wreath below, surrounded by design. Mintage: 15,433,000 + N/A Proof. Minted Years: One year type. These were followed in 1979 by a second series of coins, in the same denominations, which bore a design of a horseman in place of the arms. 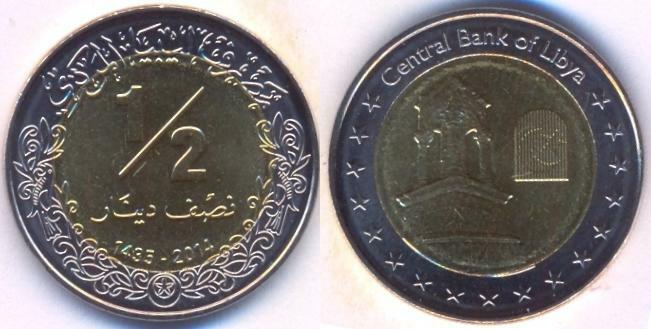 ¼ and ½ dinar coins were issued in 2001 and 2004, respectively. 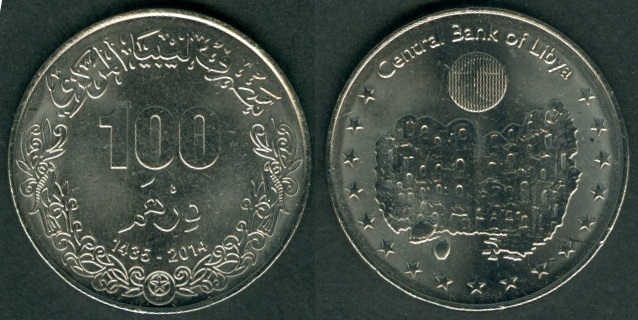 In 2009, new 50, 100 dirhams, ¼ and ½ dinar coins were issued. 1, 5, 10, and 20 dirham coins are rarely used as units of exchange. However, they still retain their status as legal tenders. On 2 March 1977, the GPC, at Gaddafi's behest, adopted the "Declaration of the Establishment of the People's Authority" and proclaimed the Socialist People's Libyan Arab Jamahiriya (Arabic: ‏الجماهيرية العربية الليبية الشعبية الاشتراكية‎, al-Jamāhīrīyah al-Arabīyah al-Lībīyah ash-Sha‘bīyah al-Ishtirākīyah). In the official political philosophy of Gaddafi's state, the "Jamahiriya" system was unique to the country, although it was presented as the materialization of the Third International Theory, proposed by Gaddafi to be applied to the entire Third World. Jamahiriya (Arabic: جماهيرية‎ jamāhīrīyah) is an Arabic term generally translated as "state of the masses"; Lisa Anderson has suggested "peopledom" or "state of the masses" as a reasonable approximations of the meaning of the term as intended by Gaddafi. KM#18 1 dirham. Year: 1979-AH1399. Weight: 1.74g [1.75g]. Metal: Brass Clad Steel. Diameter: 16.00 mm. Edge: Reeded. Alignment: Medal. Mint: N/A. Obverse: Horseman in the center with dates on his both sides. "Socialist People's Libyan Arab Jamahiriya" in Arabic at the bottom. Reverse: "1 dirham" value in Arabic with wreath below, surrounded by design. Mintage: 1,000,000. Minted Years: One year type. KM#19 5 dirhams. Year: 1979-AH1399. Weight: 2.46g [2.50g]. Metal: Brass Clad Steel. Diameter: 18.00 mm. Edge: Plain. Alignment: Medal. Mint: N/A. Obverse: Horseman in the center with dates on his both sides. "Socialist People's Libyan Arab Jamahiriya" in Arabic at the bottom. Reverse: "5 dirham" value in Arabic with wreath below, surrounded by design. Mintage: 2,000,000. Minted Years: One year type. KM#20 10 dirhams. Year: 1979-AH1399. Weight: 2.99g [3.00g]. Metal: Copper-Nickel Clad Steel. Diameter: 19.50 mm. Edge: Reeded. Alignment: Medal. Mint: N/A. Obverse: Horseman in the center with dates on his both sides. "Socialist People's Libyan Arab Jamahiriya" in Arabic at the bottom. 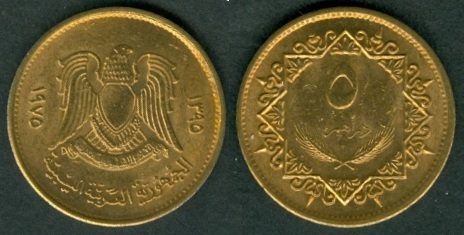 Reverse: "10 dirhama" value in Arabic with wreath below, surrounded by design. Mintage: 4,000,000. Minted Years: One year type. KM#21 20 dirhams. Year: 1979-AH1399. Weight: 5.51g [5.50g]. Metal: Copper-Nickel Clad Steel. Diameter: 24.00 mm. Edge: Plain. Alignment: Medal. Mint: N/A. Obverse: Horseman in the center with dates on his both sides. "Socialist People's Libyan Arab Jamahiriya" in Arabic at the bottom. Reverse: "20 dirhama" value in Arabic with wreath below, surrounded by design. Mintage: 6,000,000. Minted Years: One year type. KM#22 50 dirhams. Year: 1979-AH1399. Weight: 6.30g [6.25g]. Metal: Copper-Nickel. Diameter: 25.00 mm. Edge: Plain. Alignment: Medal. Mint: N/A. Obverse: Horseman in the center with dates on his both sides. "Socialist People's Libyan Arab Jamahiriya" in Arabic at the bottom. Reverse: "10 dirham" value in Arabic with wreath below, surrounded by design. Mintage: 9,120,000. Minted Years: One year type. KM#23 100 dirhams. Year: 1979-AH1399. Weight: 7.98g [8.00g]. Metal: Copper-Nickel. Diameter: 27.50 mm. Edge: Reeded. Alignment: Medal. Mint: N/A. Obverse: Horseman in the center with dates on his both sides. "Socialist People's Libyan Arab Jamahiriya" in Arabic at the bottom. Reverse: "100 dirham" value in Arabic with wreath below, surrounded by design. Mintage: 15,000,000. Minted Years: One year type. Libya was renamed in Apr 1986 as Great Socialist People's Libyan Arab Jamahiriya [(الجماهيرية العربية الليبية الشعبية الإشتراكية العظمى) al-Jamāhīrīyah al-‘Arabīyah al-Lībīyah ash-Sha‘bīyah al-Ishtirākīyah al-‘Uẓmá]. This phrase is written on all the coins issued in 2001, 2004 and 2009. KM#26 1/4 Dinar. Year: 1366 solar years after Prophet Muhammad's death [2001 CE]. Weight: 11.27g [11.25g]. Metal: Nickel-Brass. Diameter: 29.00 mm. Edge: Reeded and Plain; 5 patched each. Alignment: Medal. Mint: N/A. Obverse: Horseman in the center with date above him. "Greater Socialist People's Libyan Arab Jamahiriya" in Arabic at the bottom. 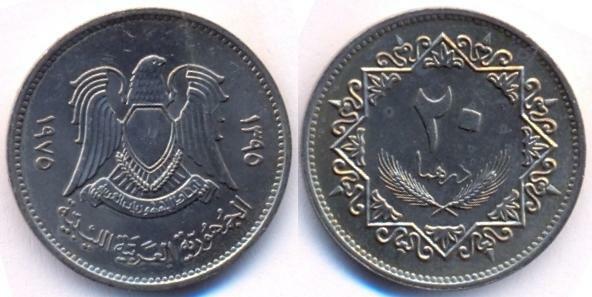 Reverse: "Quarter Dinar" value in Arabic with wreath below, surrounded by design. Mintage: N/A. Minted Years: One year type. KM#27 1/2 Dinar. Year: 1372 solar years after Prophet Muhammad's death [2004 CE]. Weight: 11.62g [11.65g]. Metal: Bi-metallic; Copper-Nickel outer ring and Brass in the center. Diameter: 29.50 mm. Edge: Reeded. Alignment: Medal. Mint: N/A. Obverse: Horseman in the center with date above him. "Greater Socialist People's Libyan Arab Jamahiriya" in Arabic at the bottom. Reverse: "Half Dinar" value in Arabic with wreath below, surrounded by design. Mintage: N/A. Minted Years: One year type. KM#28 50 dirhams. Year: 1377 PD -2009. Weight: 5.44g [5.50g]. Metal: Copper-Nickel. Diameter: 24.75 mm. Edge: Plain. Alignment: Medal. Mint: N/A. Obverse: "Greater Socialist People's Libyan Arab Jamahiriya" in Arabic at the top. Horseman in the center. Dates at the bottom. Reverse: "50 dirhama" value in Arabic with wreath below, surrounded by design. Mintage: N/A. Minted Years: One year type. KM#29 100 dirhams. Year: 1377 PD -2009. Weight: 6.94g [7.00g]. Metal: Copper-Nickel. Diameter: 27.00 mm. Edge: Plain. Alignment: Medal. Mint: N/A. Obverse: "Greater Socialist People's Libyan Arab Jamahiriya" in Arabic at the top. Horseman in the center. Dates at the bottom. Reverse: "100 dirham" value in Arabic with wreath below, surrounded by design. Mintage: N/A. Minted Years: One year type. KM#30 1/4 Dinar. Year: 1377 solar years after Prophet Muhammad's death - 2009 CE. Weight: 8.14g [8.15g]. Metal: Nickel-Brass. Diameter: 29.00 mm. Edge: Reeded and Plain; 5 patched each. Alignment: Medal. Mint: N/A. Obverse: "Greater Socialist People's Libyan Arab Jamahiriya" in Arabic at the top. Horseman in the center. Dates at the bottom. 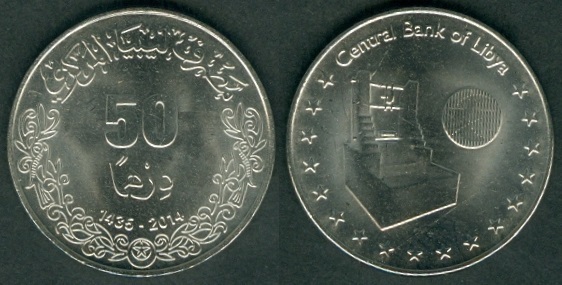 Reverse: "Quarter Dinar" value in Arabic with wreath below, surrounded by design. Mintage: N/A. Minted Years: One year type. Note: Besides the design and legend size difference from 1369 PD issue, this coin has a horizontal edge on the top instead of the pointed one. The thickness of the coin is also reduced as indicated from the weight. KM#31 1/2 Dinar. Year: 1377 solar years after Prophet Muhammad's death - 2009 CE. Weight: 10.33g [10.50g]. Metal: Bi-metallic; Copper-Nickel outer ring and Brass in the center. Diameter: 29.50 mm. Edge: Reeded. Alignment: Medal. Mint: N/A. Obverse: "Greater Socialist People's Libyan Arab Jamahiriya" in Arabic at the top. Horseman in the center. Date at the bottom. Reverse: "Half Dinar" value in Arabic with wreath below, surrounded by design. Mintage: N/A. Minted Years: One year type. in rebellion to 23 Aug 2011 in Benghazi. KM#33 50 Dirhams. Year: 2014-AH1435. Weight: 5.01g [5.00g]. Metal: Copper-nickel clad steel. Diameter: 22.90 mm. Edge: Reeded. Alignment: Medal. Mint: N/A. Obverse: "مصرف ليبيا المركزي" (Central Bank of Libya) in Arabic written at the top. 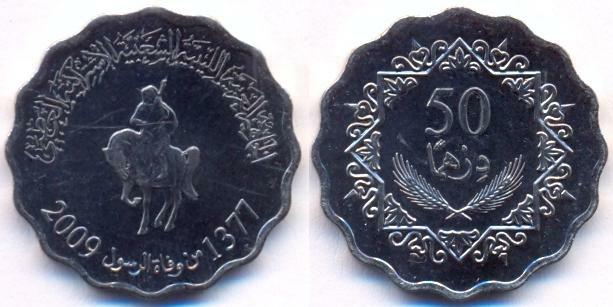 "50 dirhama" value in Arabic in the center. Dates "1435 - 2014" at the bottom. Decorated design at the bottom section. Reverse: "Central Bank of Libya" written at the top. North African well for irrigation on the left side and round shape hologram ("crescent" from one angle and "star" from another angle) on the right in the center. 17 stars near the edge at the bottom section. Mintage: N/A. Minted Years: One year type. Note: This type of well used mostly for irrigation. It is construction in such a way to withdraw large quantity of water at a time. Therefore it needs a force of domestic animals to pull the water out. Water afterwards is directed towards special canals and irrigated field crops. The coin is reported to be released for circulation on 15th December 2014. KM#35 100 Dirhams. Year: 2014-AH1435. Weight: 6.52g [6.50g]. Metal: Copper-nickel clad steel. Diameter: 26.00 mm. Edge: Plain. Alignment: Medal. Mint: N/A. Obverse: "مصرف ليبيا المركزي" (Central Bank of Libya) in Arabic written at the top. "100 dirhama" value in Arabic in the center. Dates "1435 - 2014" at the bottom. Decorated design at the bottom section. Reverse: "Central Bank of Libya" written at the top. A round shape hologram ("crescent" from one angle and "star" from another angle) above the Kasr Kabaw. Interior view of Kasr Kabaw in the center. 17 stars near the edge at the bottom section. Mintage: N/A. Minted Years: One year type. Note: Kasr Kabaw is a Berber Granary fortress-village located in Kabaw, Nalut District of Tripolitania Region (North-West part of Libya). The coin is reported to be released for circulation on 15th December 2014. KM#32 1/4 Dinar. Year: 2014-AH1435. Weight: 6.56g [6.60g]. Metal: Brass. Diameter: 26.00 mm. Edge: Reeded. Alignment: Medal. Mint: N/A. Obverse: "مصرف ليبيا المركزي" (Central Bank of Libya) in Arabic written at the top. 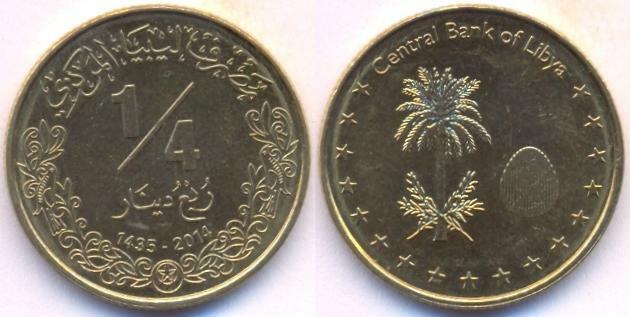 Value "1/4" in the center with "ربع دينار" (Quarter Dinar) written below it. Dates "1435 - 2014" at the bottom. Decorated design at the bottom section. Reverse: "Central Bank of Libya" written at the top. Tree at left side and oval shape hologram (Value "1/4" from one angle and "crescent / star" from another angle) on the right in the center. 17 stars near the edge at the bottom section. Mintage: N/A. Minted Years: One year type. Note: The new quarter-dinar coin was issued on 16th February 2014 to commemorate the third anniversary of the revolution. KM#33 1/2 Dinar. Year: 2014-AH1435. Weight: 7.09g [7.10g]. Metal: Bi-metallic; Copper-Nickel outer ring and Brass in the center. Diameter: 27.00 mm. Edge: Reeded. Alignment: Medal. Mint: N/A. Obverse: "مصرف ليبيا المركزي" (Central Bank of Libya) in Arabic written at the top. 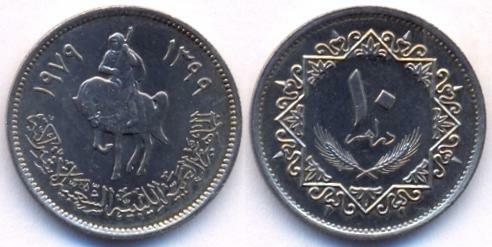 Value "1/2" in the center with "نصف دينار" (Half Dinar) written below it. Dates "1435 - 2014" at the bottom. Decorated design at the bottom section. Reverse: "Central Bank of Libya" written at the top. Stage at left side and hologram (Value "1/2" from one angle and "crescent / star" from another angle) on the right in the center. 17 stars near the edge at the bottom section. Mintage: N/A. Minted Years: One year type. Note: Issued on 11th May 2014.